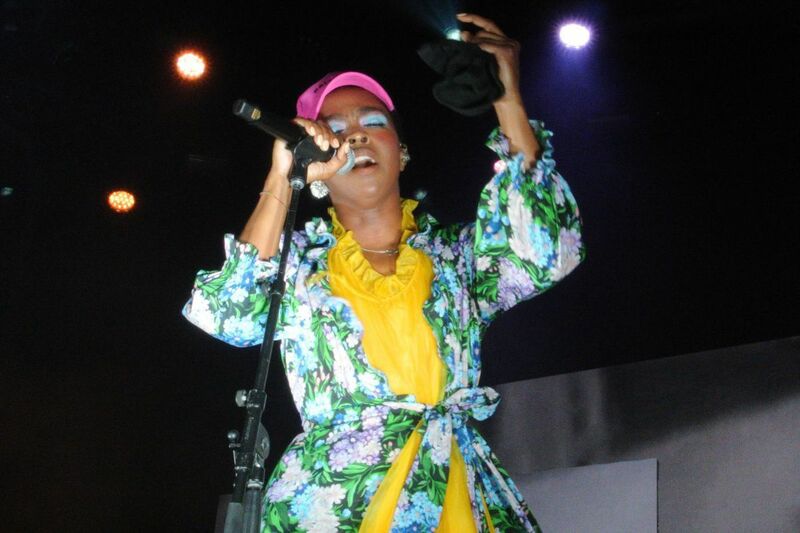 Lauryn Hill performs at Festival Pier, July 13, 2018. It's been 20 years since Lauryn Hill's solo debut album, The Miseducation of Lauryn Hill, shifted the zeitgeist of the music industry and on Friday, Hill brought her commemorative Miseducation tour to Philly's Festival Pier. A crowd of varied ages and backgrounds scattered the sandy festival grounds to celebrate an album that has not only helped define the merging sounds of hip-hop, R&B, and reggae but gave language to the many nuances of love and relationships. As the sun set, openers Tierra Whack, Jo Mersa Marley, an energetic Busta Rhymes — who sported a flashy, gold-encrusted biker jacket — and M.I.A. prepped the audience for Hill's set. Sounds of afrobeat, hip-hop, R&B, and dancehall were woven into the atmosphere while an eager crowd waited for the headlining act. Chants of "Lauryn! Lauryn! Lauryn!" could be heard during the final moments before Hill's entrance. The stage went dark and a recording of the opening classroom skit from Miseducation began to play. Cheers from the crowd followed. When the skit ended, Hill walked onto the stage, which was set with an elaborate band including a brass trio and an organ. Hill's demeanor edged the precipice of humility and confidence when she greeted her audience dressed in a fashionable floral-print tulle ensemble, topped with a pink baseball hat and large stoned earrings. Hill dived right into a string of songs from Miseducation, such as "Every Ghetto, Every City," "Lost Ones," "Everything Is Everything," and "Superstar." Hill proved herself vocally agile with a more textured and mature sound. Her performance seemed to have come from an honest place as if she were reliving the experiences that inspired the songs of Miseducation. As Hill delivered each song, images of black joy — graduations, family life, and jovial dancing—were projected on screens in the backdrop of the stage. At one part in the show, Hill rapped nearly a cappella, with only a drumbeat to keep cadence, as a pronounced reminder of her hip-hop roots. The show flowed seamlessly until the band played the introduction of "Ex-Factor," which sent the audience into a frenzy. It was clear that this song was the fan favorite. "It could all be so simple … ," the audience sang over Hill's amplified voice. Couples embraced and others swayed their arms in the air and sang the lyrics that described the perilous relationship with an ex. Hill cut the music at the break of the song, bringing attention to the intentionality and honesty of her performance. Hill seemed to be in a world of her own under the blue stage lights. She wasn't concerned about being pretty, as beads of sweat rolled down her face. With her eyes closed and her handkerchief clenched, she took in the praise of an enthusiastic audience. While Hill's performance was impressive in almost every aspect, there was a missed opportunity for Hill's own commentary. The quick pacing of the show made some songs feel rushed, but to Hill's credit, it is ambitious to sing every song on an album in one sitting. Her soul-stirring performance of "To Zion" — an ode to her eldest son — was spellbinding but could have used a talking point to give the song more context. After 20 years since its release, The Miseducation of Lauryn Hill has immortalized itself in the hearts of millions around the world. The Miseducation Tour reminds us why.